The garden at Charlton Station is our first garden and was started in April 2013. It is being developed as an organic, demonstration garden to show that food can be grown in small spaces as well as provide habitats for wildlife . We have been supported with a grant from the National Gardens Scheme/Royal Horticultural Society Elspeth Thompson Bursary, and we have been given use of the station area by Southeastern Railways. The garden is run with a Management Committee of 9 people. A series of open meetings and the interest of enthusiastic passers-by has given us a list of nearly 100 volunteers and supporters who carry out the tasks of seed sowing, planting, weeding, watering and maintenance. 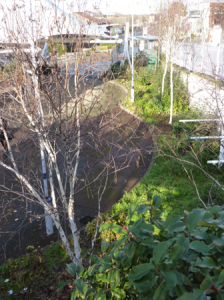 Having a garden here at the station is excellent for visibility and ensures we are available to the whole community. Our volunteers span the categories: family members and live-alones, old and young, experienced and novice gardeners. Here’s a shot of the site before we started …. and we now have a herb garden, four raised beds which are planted with vegetables and salad crops all year round, currant bushes, a grape vine, wildlife friendly herbaceous border and winter interest area. There is a real sense of community when the volunteers are gardening together with passersby on the street and the station admiring the progress and offering their assistance. We would like to say a big thank you to all volunteers who helped with the initial clearing of the site, filling the raised beds and planting as well as making our plant sales a success. An especial thank you to the residents of Troughton Road who lend their green bins and have supported us with watering. We are now planning for our third summer gardening season in 2015. Please join us at our future gardening sessions in April and May as well as community events. For more information and dates, take a look at our What Next page. In the meantime, happy gardening.